KIEV, December 26. /TASS/. 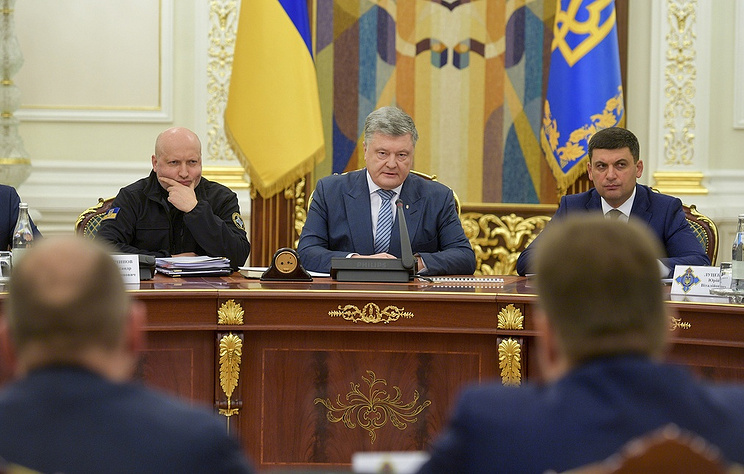 The National Security and Defense Council of Ukraine (NSDC) at a meeting on Wednesday decided to impose additional sanctions on Russian individuals and legal entities. “Following the discussion of the issue “On application of personal special economic and other restrictive measures (sanctions)”, it was decided to support the introduction of sanctions, primarily against legal entities and individuals – Russian companies, businessmen, politicians and deputies, law enforcement officers who actively supported or contributed to aggressive actions against Ukraine,” according to the press release. In addition, “restrictive measures” have been introduced against organizers of elections in Donbass, as well as “against military personnel, judges and law enforcement officers involved in the unlawful seizure of Ukrainian sailors during the Russian aggression act against Ukraine in the Kerch Strait on November 25, 2018, and their illegal detention in Russian prisons.”. Hey Buddy!, I found this information for you: "NSDC of Ukraine imposes additional sanctions on individuals and legal entities in Russia". Here is the website link: https://russophile.org/nsdc-of-ukraine-imposes-additional-sanctions-on-individuals-and-legal-entities-in-russia/. Thank you.